Heat a non-stick frying pan over a medium-high heat. Make a 3-4cm cut lengthways on top of each chicken breast, through the skin. Put the chicken breasts in the pan, skin-side down, and sear for about 30 seconds. Turn and sear for another 30 seconds or so. Set aside. Mix the cream cheese with the garlic and herbs and season. Roll the herby cheese into four balls and stuff these into the slits in the top of the chicken breasts. Put the chicken, skin-side up, in an ovenproof dish and bake for 35 minutes. Meanwhile, make the sauce. Heat the olive oil in a frying pan over a medium heat. Add the bacon and gently sauté for 5 minutes or so, until browned. Add the leek and continue to cook until the leeks start to colour. Add the white wine, bring to the boil and boil to reduce by half. Add the cream and cook gently for another 4-5 minutes. Season to taste. 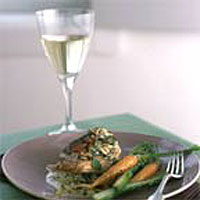 To serve, pour the sauce on to warmed plates, and place a chicken breast on top. Garnish with any remaining herbs.